Is there something that reminds you, especially the lovers of music? Yes, you have come across with that line especially the avid followers of The Beatles. You see it is similar to The Beatles' song, "When I'm Sixty-Four." "Old wood is best to burn. Old wines are best to drink. Old wise men are best to ask advice from. Old friends are still the most precious like gold. "So it's not that bad to be old at all because the older we get, the better people we are supposed to become." He quoted Psalm 92:14 the Bible (New International Version), "They will still bear fruit in old age, they will stay fresh and green." I replied him. I sent this: "God provides everything. He always there. Therefore, take the letter G from God and append to the word OLD and you will have GOLD. That is why old persons are as precious as the gold. My pastor friend didn't reply. September was the last month that I could receive my salary. I have little left for October. In short, I didn't have any budget for the celebration of my birthday together with my wife for we've the same birthday. Our 3-year old granddaughter asked us when is our birthday. I said October 13. She came to the calendar that was hanged on the wall and asked me to point it. Then she followed up if we could have a birthday cake too which she used to have on her birthday. I didn't answer. It was October 13. I woke up early and woke up my wife with a morning kiss. I got out from the house to take an hour of morning walk. While I was strolling at the public plaza my cell phone vibrated. I checked it to find the message from my male teacher. I was invited to come to school before 10 O'clock in the morning. I replied I will. I requested my son-in-law Almon to bring me to school through his motorized tricycle. We arrived there past 10. Two teachers escorted me to the school's covered court. I saw the stage was well-decorated with a birthday greeting inscribed on a 3x5 tarpaulin. My teachers, the PTA, and the pupils had indeed prepared for my birthday celebration. It was a successful one. 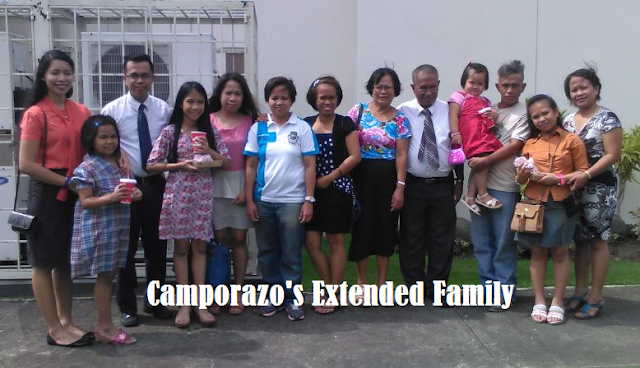 I went home bringing some extra foods to give to my five grandchildren. No preparation so far at home for our synchronous birthday with my wife. By and by our youngest daughter Geree and our daughter-in-law grabbed our hands and led us to the next room in our house where our eldest daughter Dona Greece and with her one daugther and a hubby live. The door was closed. What is this? I asked. Then the door was opened. My wife and I saw several foods on the table. There was a birthday cake with a number candle of 65. The wall was decorated with party balloons and a 3x5 tarpaulin of birthday greetings to both of us was hanged. Before the party started, Inday Carissa played a video on the laptop. It showed our memorable pictures from our high school days, college, our family and up to the present. The most touching part on the video was the personal greetings of my 5 children for the other one was living in Mindanao. He was unable to send his video greeting. The last person who gave the message was Inday Sophie Ashley Lory, our smart 3-year old girl. She even sang the Happy Birthday song. The surprised birthday party was concluded by our message to our children, grandchildren, and to our son and daughter in laws. Some of them were emotional. Nanay Rebing while giving her message was crying and Inday Sophie hide behind the plastic chair. When we're sixty-five, our family still give the value on togetherness. The more we get together the happier are we as the song goes. The big cake was provided by An An, our daughter who is working abroad. The foods were shared by Gingging, Dona, and Toto Jun. While our youngest daughter, Geeree gave us a birthday presents. Polo shirt for me, and a blue dress and a gold necklace for her mother. The best friend of our eldest daughter Dona gave us a silver ring. That's it. Our family can be together forever when we eat together, when we pray together and go to Church together. 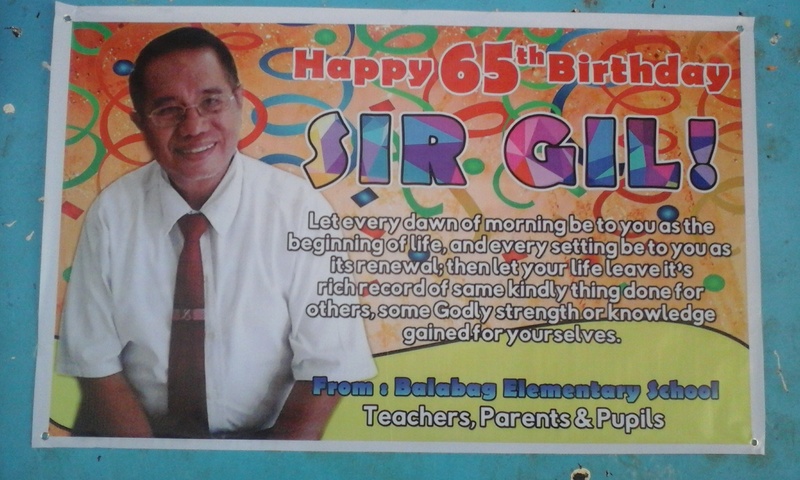 Wow, Belated happy birthday sir Gil! and congratulations or i should say enjoy your retirement :) by the way, starting next week Negros , Cebu and Visayas provinces na assignment ko- sana ma meet po kita. That is a good news. I hope to seeing you too. God bless in your travel assignment. I hope you could go back on May or April so that you could cover our annual Pasalamat Festival. Happy Birthday sir,wish you spend your retired life much joyful and full of fun. Thank you. It's an emotional occasion on the special day between us, my wife and me. I know how my children and granddaughters love me more. Happy Birthday and you are really love by the people around you. Thank you, Franc. That's one of the reasons why I am in the point of having a mixed feelings, either I would be sad or I would be happy. Old wood is best to burn. Old wines are best to drink. Old wise men are best to ask advice from. Old friends are still the most precious like gold. "So it's not that bad to be old at all because the older we get, the better people we are supposed to become. Belated happy birthday Sir! I love your reply to the text message, I also believe that God provides, we just wait and let things happen according to His will. Happy 65th birthday Sir Gil. I wish you more happiness and good health. Nothing beats when our family surprised us. I bet you had a blast from the photos.